Spinks then ranked number one among the world's heavyweight challengers. He made history on February 15, 1978, when he beat Muhammad Ali in a 15-round decision in Las Vegas. Spinks thus won the world heavyweight title in only his eighth fight, the fastest ascent in history. Ali, who had not been the same since his last fight with Joe Frazier, expected an easy fight, but he was out-hustled by Spinks who never seemed to tire in the bout. 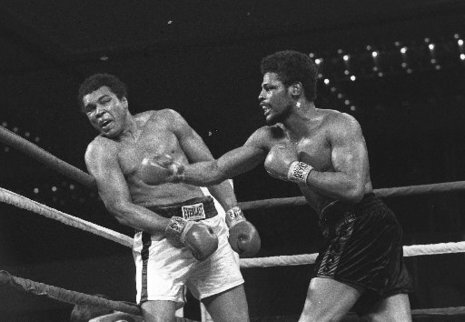 The victory over Ali was the peak of Spinks' career. In this victory, Spinks became the only man ever to take an actual title belt away from Muhammad Ali in the ring, since Ali's other losses were contests where no official world title belt that he was in possession of was on the line at the time. Spinks' iconic gap-toothed grin was featured on the cover of the February 19, 1978 issue of Sports Illustrated. He never again fought as efficiently. 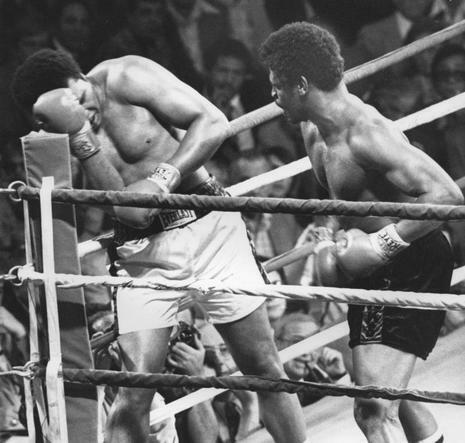 In February 1976, Ali easily beat Jean-Pierre Coopman. In April 1976 he defeated Jimmy Young and then Richard Dunn the following month, which would turn out to be Ali's last knockout victory. Following that fight, he staged an exhibition match with professional wrestler and Mixed Martial Artist Antonio Inoki. Although widely perceived as a publicity stunt, the match against Inoki would have a long-term detrimental affect on Ali's mobility. Inoki spent much of the fight on the ground trying to damage Ali’s legs, while Ali spent most of the fight dodging the kicks or staying on the ropes. At the end of 15 rounds, the bout was called a draw. Ali's legs, however, were bleeding, leading to an infection. He suffered two blood clots in his legs as well. In September 1976, at Yankee Stadium, Ali faced Ken Norton in their third fight, with Ali winning a close but unanimous 15-round decision. 1977 saw Ali defend his title against Alfredo Evangelista and Earnie Shavers. Fight doctor Ferdie Pacheco left Ali's camp following the Shavers fight after being rebuffed for advising Ali to retire. In February 1978, Ali lost the heavweight title to 1976 Olympics Champion Leon Spinks. On September 15, 1978, Ali fought a rematch in the New Orleans Louisiana Superdome against Spinks for the WBA version of the Heavyweight title, winning it for a record third time. Venue: Hilton Pavillion, Las Vegas. 15th February, 1978. The 1976 Olympic Heavyweight Champion Leon Spinks was a rookie professional with just five fights and a manager called Butch Lewis behind him. Muhammad Ali was first cool on taking the fight but then figured out an angle to sell the fight. Ali, himself an Olympic Champion, had beaten all the other gold medalists of his era; namely Floyd Patterson (1956), Joe Frazier (1964) and George Foreman (1970). The raw and ill-disciplined Spinks offered Ali the chance to beat another olympic champion. Ali did not really train for the fight with the rumour being that he only sparred twenty rounds in preperation. Still, Ali should have been able to handle Spinks. But, the pattern of Ali's most recent fights was repeated. Ali lay on the ropes while the challenger built up a lead. The champ summoned something for the last round and drove Spinks into the ropes, but it was not enough. Ali lost a split decision, which appeared a little kind to the beaten champ.